Wither, the first novel in Lauren DeStefano’s Chemical Garden Trilogy, is a dystopian tale of arranged marriage and secret love. There is a healthy dose of disturbing details in this book also, but it is very elegantly and eloquently written. In a book like this, there are so many characters for the author to choose to antagonize, and I was pleasantly surprised when DeStefano didn’t go with the obvious choice. In a story where not being able to choose your husband is the norm, one would expect the groom to be the antagonist. However, in Wither, this is not necessarily the case. 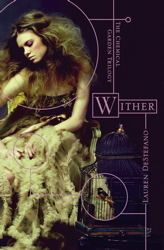 So if you’re into dystopia dosed with a healthy shot of star-crossed love and equal parts creep-factor, pick up a copy of Wither the next time you’re at a bookstore or library. Overall, I’d give this at least 4 stars (out of 5, not 10!). This entry was posted in Reviews, Uncategorized and tagged book, destefano, dystopia, lauren, review, romance, wither, writing. Bookmark the permalink. Road Trip Wednesday #168: What Do You Love About Writing?